-- Pump up the hand pump about 8 -10times, until could not pump into the air to get high pressure gas. -- Install the appropriate plug according to the size of the pipe diameter. -- Remove all loose articles from the sink before using the drain cleaner. -- Plug or cover all over flow or air outlet openings on the same drain line on sinks, bathtubs, etc. With a wet terry cloth to prevent dirt or other material from spraining out while the drain cleaner is in use.When using a drainage cleaner to plug a toilet, cover the opening with a complimentary film to prevent debris and water from splattering up. -- Tip for partly clogged pipes and drain : fill your drain pipe with warm water and light detergent before using the gun.The drain cleaner is only effective if the water level is above the top of the rubber adapter when it is placed over the blocked outlet. -- For optimum use you do have to fill the clogged pipe or drain with water before using the gun.Any remaining air in the drain system will significantly reduce the cleaning power of the gun! -- If you do not use the drain cleaner gun you do have to release any remaining air pressure.Never leave the gun unprotected while it is still under air pressure.Store the drain cleaner in a dark ,dry place. Multi-Function -- It has four suckers of different sizes, 3.5×6.5cm/1.38×2.56in, 2.5×5cm/0.98×1.97in, 11.5cm/4.53in, 4.5×11.5cm/1.77×4.53in, which can be used in toilet, washbasin, bathtub, shower, sink, squat toilet, floor drain, blocked pipe, etc. Material - ABS gun body, natural rubber blocked head.Gun body size :(L)×(W) 27.5×28cm/10.8×11in.Weight: 1.87 pounds.We use a natural rubber blocked, which is tough and durable and suitable for our drainage system. 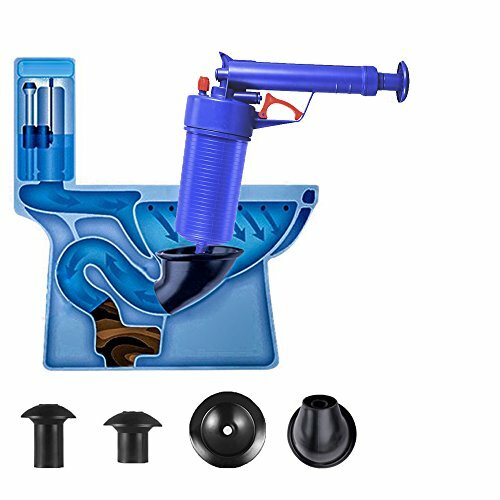 Easy To Use-The drain blaster uses the power of high-pressure compressed air to blast away the toughest clogs in your drains in just seconds.Just pump the drain blaster and squeeze the trigger, the clog is cleared instantly..It's much faster than traditional pillars and snakes, and there's no extra time at the drain. Reusable And Economical - It is reusable and can last for years, cleaning clogs without having to call a plumber, saving the plumber a lot of money. High Pressure -Strong pressure makes it easy to deal with all kinds of blockages caused by various rubbish, such as hair, cloth, tea, leaves, oil, grease, and grease.Under high pressure air power, it can remove sewers quickly and easily.Suitable for sink, bathtub and toilet work. If you have any questions about this product by SUNLYCH, contact us by completing and submitting the form below. If you are looking for a specif part number, please include it with your message.